Description: A rough cut square granite column is mounted on a base in the city park. 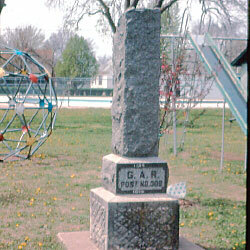 It is inscribed: "1884 ~ G.A.R. ~ Post No. 308 ~ 1929". 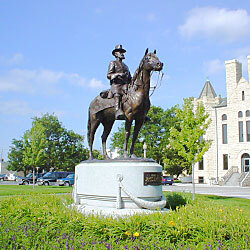 Description: The Bronze equestrian statue of General McPherson is mounted on a granite base. The inscription on the base reads: "James B McPherson Post No 187 G.A.R.". In front of the statue is a plaque reading: "Major General James B. McPherson ~ Commander Of The Army Of The Tennessee ~ Born At Clyde, Ohio, Nov 14, 1828 ~ Fell In The Service Of His Country At The Battle Of Atlanta ~ July 22, 1864 ~ Erected By The Citizens Of McPherson County, 1917". "The World Never Can Forget What They Did ~ McPherson County's Role of Honor ~ 1861 ~ 1865 followed by names of those who served." 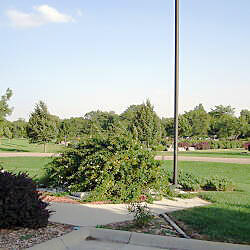 Description: A burial cover is mounted next to a flagpole. The granite marker is inscribed: "In Memory ~ Of Our ~ Departed ~ Comrades". This is almost overgrown by a bush. A bronze plaque at the base of the flagpole reads: "Flag Pole Donated By ~ Veterans of Foreign Wars Post 2715 ~ Post and Auxiliary ~ American Legion Post 24 ~ Post and Auxiliary ~ Sons / Am Legion Sqd. 24 ~ 1997".